Stress is one of the most often used words today. But just what is stress, and exactly how does it affect us? Let us begin with the definition of stress. Stress is a response of the body to stimuli. Noise, heat or cold are not stresses. They are stimuli. The response they cause in the body is called stress. This means that if your neighbor is playing his stereo at full volume, but you have an excellent set of earplugs, there is no stress! There is stress only if you respond. The impact of any event or stimulus depends on how you respond (or don’t respond) to it. On a more general level, stress is the underlying response of an organism to its environment. This is a most important concept to understand, and it is the basis for the hair analysis patterns that are revealed on the hair mineral tests. The minerals on the test have value in themselves. However, in addition, Dr. Paul Eck figured out how they represent the responses of the body to stress of many kinds in the environment. This is a great secret and key to understanding hair mineral analysis by the method of Dr. Paul Eck. External stress. Our bodies are continuously having to respond to the world around us. This includes the ground we walk upon, the outer temperature, wind, rain, snow, sounds, sights, people, and hundreds of subtle factors such as smells, tension in the world, one’s financial and social situations and more. Internal stress. The body also must respond to changes in the internal environment of the body, such as too much warmth or cold, hunger, thirst, diseases in the body, strain and tension on muscles, tendons, ligaments and joints, the body’s position in space and how gravity is affecting the body, and thousands of other parameters or factors. The body must continuously adjust the blood sugar level, the blood pressure level and the levels of all the minerals, vitamins, hormones, and hundreds of other nutrients and chemicals that we are made of. This is the continuously changing response to internal stress that keeps us alive. An important principle is that usually it is far easier to work with and control internal stress than it is to control external forces. Non-specific nature of the stress response. Dr. Hans Selye discovered that the body’s overall response to stressors of all kinds is similar. This means that the body’s response to a loud noise, extreme cold, a bacterial infection, a toxic metal, or worry can all cause the same stress response. It doesn’t matter if the stressor comes from within the body (bacteria) or from outside the body (noise, for example). This is an important principle of the General Adaptation Syndrome, which is what Dr. Selye called the way the body responds to stress. The stages of stress. Dr. Selye divided the response into three stages: alarm, resistance and exhaustion. All organisms go through these three stages of stress, which are followed by death. One can go through all three stages in minutes, or it can take 100 years. The progression of the stages of stress are mediated through the adrenal and thyroid glands. Dr. Paul Eck realized that he could identify these stages with fair accuracy using a hair mineral analysis providing the hair sample is not washed at the laboratory. Knowing which stage of stress the body is in is most helpful to recommend diets, nutritional supplements and other procedures to gently and safely move the body to a healthier stage of stress. With a hair mineral analysis, this is done with mathematical accuracy. Dr. Eck’s research on hair analysis was greatly assisted by incorporating the stress theory into the interpretation of the hair analysis. Knowing the stage of stress, one knows a lot about how a body is functioning. This allows one to move beyond symptoms and correct underlying body chemistry. Dr. Eck discovered the alarm stage of stress roughly correlates with fast oxidation. The resistance stage of stress roughly corresponds to a mixed oxidation pattern. It may also correlate with a fast oxidation pattern with a low sodium/potassium ratio. The exhaustion stage of stress roughly corresponds to a very slow oxidation rate. Mineral levels change in accord with the stage of stress. For instance, in the alarm stage, sodium rises. As the resistance stage begins, sodium begins to drop. It continues even lower in the exhaustion stage. One can determine the stage of stress with numerical accuracy from the tissue mineral levels and ratios. Internal causes of stress include nutritional deficiencies, bacterial or viral infections, subluxatedvertebrae, hardened arteries, weak muscles, toxic metals in enzyme binding sites, poor circulation, fatigue, energy imbalances, fear-based emotional patterns, neuroses or rigid ideas. External stressors include family problems, financial struggles, school difficulties, interpersonal problems, extreme heat or cold, polluted air and water, improper diet, low-quality food, toxic medications, drugs and other poisons, and many other factors that appear ‘external’ to us. The internal and the external factors of stress combine to create stress responses. Noise can be a potent stressor. This includes televisions, radios and even too much or too loud talking. The presence of other people, especially for babies and children, can be stressful. Some people are affected by even more subtle factors such as electromagnetic waves, colors, tone of voice, and even a person’s ‘aura’. We have all heard the phrase, “there was so much anger in the room you could cut it with a knife”. There are even spiritual stressors. Just telling the truth, or speaking up to a friend, can cause much stress. For innocent children, hearing false statements by parents like “you are a bad child” can be a horrendous stress. Everyone copes with stress all the time. If we are healthy, it means we are able to cope and respond adequately to our internal and our external environments. As the body weakens, or if stress is excessive, the body’s ability to respond correctly and appropriately to stress begins to decline. This can occur at any age. In fact, it usually begins shortly after birth in some ways, because babies today are born quite deficient in some essential nutrients such as zinc. They are also often born with too much copper, lead, aluminum, and other toxic metals and toxic chemicals in their bodies due to these excesses in their mothers. This is one important cause for infections, ADD, ADHD, other learning and developmental problems of infants and young children. Each of the stages of stress is a lower energy state. The goal of a nutritional balancing program is to move the body from a lower energy and less healthful stage of stress to a more healthful stage of stress. Another principle of stress is that coping or adapting to stress uses up energy. When energy improves on a nutrition program, it is because there is less biochemical stress on the body, and thus more adaptive energy is available. This is an important principle that helps explain ‘healing reactions’, and the success of nutritional balancing programs. The ideal stress response is a minimally upsetting response. On a hair analysis it would be to maintain a balanced oxidation rate. To do this one must be able to absorb or “digest” every experience without reacting to it. This can only occur if one is not attached to any physical or emotional state or condition, and if the body is quite healthy. Of course, some types of stressors require a vigorous response, but even here, the most healthful response would be one that upsets the status quo of the body the least. Emotional detachment. When an emotional upset occurs the body and mind should be able to handle it without becoming too unhappy, angry or upset. In philosophy, this is often called a state of ’emotional detachment’, or “living in the world, but not being of the world”. One can assist the body and mind to respond appropriately to all types of stress by balancing and strengthening body chemistry. This can help one to cope with everything from invading bacteria or viruses, to negative thoughts, fearful emotions and physical, social or financial hardship. An important principle of nutritional balancing science is that reducing the internal stress on the body, one can handle or digest more external stress. Some people are under the misconception that all stress is bad. Nothing could be further from the truth. Dr. Hans Selye, who originated the stress theory of disease, wrote a book entitled Stress Without Distress. He explained that certain kinds of stress are essential for health. These range from physical exercise which keeps our bones and muscles strong, to mental stress or stimulation which keeps us mentally alert, and may help avoid senility. There are many other types of positive or beneficial stressors. In fact, healing therapies including nutritional balancing science sometimes intentionally apply a ‘positive stressor’ to the client in order to assist healing. The ‘good’ stressor may be a chiropractic adjustment, a massage, a new diet, vitamin supplements or spoken words. These may be felt at first as stressful. However, if the act or information is applied correctly, it results in a positive or healing change in the body. Because stress is a response that depends on how one reacts, the same event may cause stress in one person, but cause no stress in another. For example, one person may adore being around cats, while another person is allergic to cat hair and feels miserable around cats. This simplistic example illustrates the principle that the stress response is individual, depending on what each person responds to. One’s physical or psychological makeup can protect or make one vulnerable to particular events. Of course, some stimuli affect everyone, such as starvation, atomic bombs, or cyanide poisoning. However, individual variation exists to some extent even in these instances. In a sense, we define ourselves by what we respond to: whether it be famine in Ethiopia, a stock market dip, sports scores, a bird singing, a sunny day, etc. Many times in order to achieve health and happiness, what must change are the events that we respond to. We tend to be shaped or influenced heavily by those stimuli or stressors to which we respond. The person who responds to the TV news tends to be shaped by that stimulus. Another is more shaped by what his friends tell him. Becoming a mature person involves finding those situations which are healthful stressors for us, even though they may not be ideal for another. Much disease and unhappiness is produced because we either conform to or rebel against the dictates of parents and teachers as to how and to what we ought to respond. A type of stress that is not often discussed is what may be called spiritual stress. A spiritual stressor is one that causes us to change or adapt in a way that improves one’s character, causes mental or spiritual development, or perhaps makes one a nicer or more aware person. For example, some people respond to truth. They seek the truth in their activities, and they guide their life by it as much as possible. Responding to the truth is a powerful positive stressor. It can certainly cause some upset, as people and events are revealed for what they really are. But it leads to an enhancement and strengthening of character as long as one seeks and follows what is revealed as the truth. Many religions recommend techniques such as prayer and meditation. If practiced correctly, these activities may also act as stressors that increase self-discipline, awareness and receptiveness to the truth. Another spiritual stressor is taking full and complete responsibility for all one’s actions, words, and thoughts. This means responding to one’s conscience, and doing what is correct in every situation no matter what the consequences. This is an important spiritual stressor for some people that also builds character and leads to mental and spiritual development in some people. Of course, one must be clear about what is right, because otherwise one may make errors of judgment and follow paths that are not healthful at all. Harmful spiritual stressors are often called temptations or sins in some circles. They would include doing what is expedient or what ‘feels good in the moment’ rather than what is right or good. Another is making a decision to please others, no matter what the cost to you and your health. Others are to eat without thought of your health, to spend money without thought of the consequences, and there are others, of course. One tends to become like that to which one responds. Anyone can choose to respond to ‘positive’ physical, emotional and spiritual stressors that have powerful beneficial effects on both mind and body. 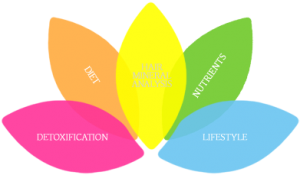 Nutritional Balancing is an advanced healing program designed to precisely assess and monitor the biochemistry of the body, creating a tailored Wholistic program for each individual to create long-term health and restore the body and mind to its full potential. This deep healing approach also removes dozens of toxic metals, hundreds of toxic chemicals, numerous latent and chronic infections, and many hidden mental and emotional blockages through gentle detoxification in the body’s own natural order. Learn more about this and many other benefits of Nutritional Balancing Science. Is Nutritional Balancing right for you?